Ari Eisinger leads a workshop on the guitar style of blues musician Blind Blake. Have you noticed a preponderance of corncob pipes and suspenders around campus? Worried you’re being outshone by the foot-long beards that cropped up around Mandel Hall last weekend? Well, have no fear; it isn’t a new trend, and you need not throw away your beard trimmer yet. Unless, of course, you plan on jumping onstage and pulling out your fiddle. 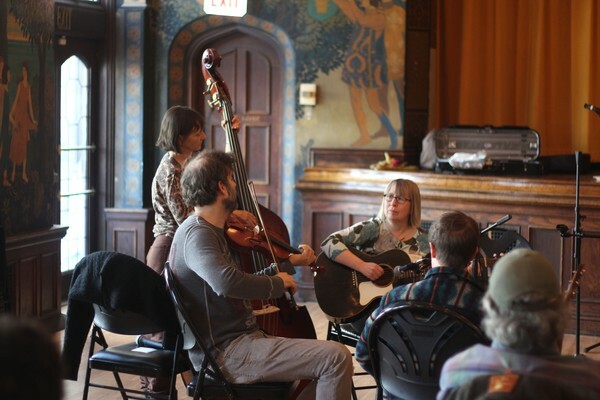 Yes, last weekend was the University of Chicago Folk Festival, and the air rung sweetly with the sound of instruments both familiar and strange. 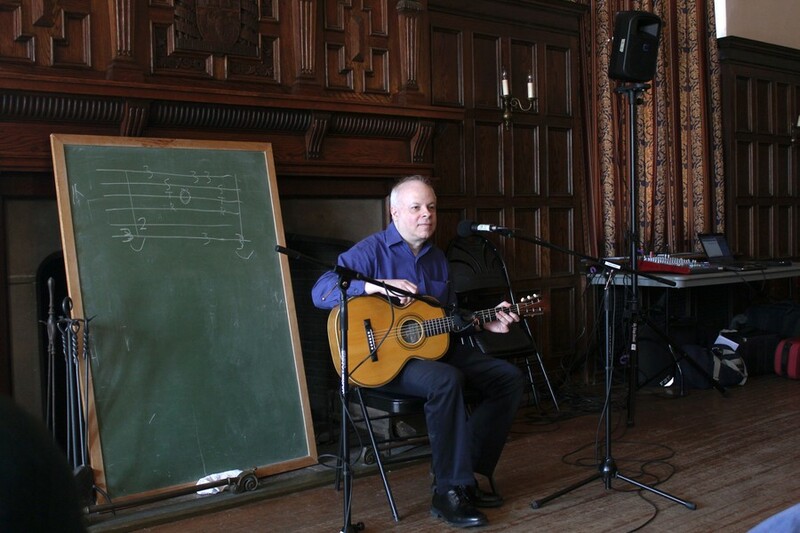 Friday, Saturday, and Sunday, the University of Chicago Folklore Society took over Mandel Hall and Ida Noyes for the 54th annual Folk Festival in Hyde Park. This year, the big names included 10-time Grammy-winning fiddler Bobby Hicks and Louisiana Music Hall of Famer Sheryl Cormier. 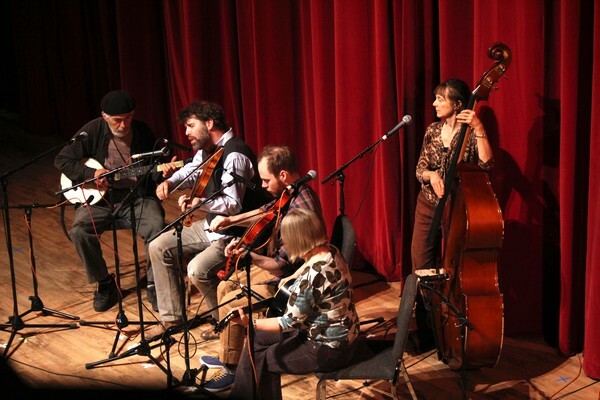 Also in attendance were Chicago-based gospel singer Calvin Bridges and Chicago Irish folk royalty, tenor Paddy Homan, guitarist Dennis Cahill, and fiddler Teresa Shine. The concert on Saturday night started with a twang courtesy of old-time (that is, Appalachian) music from supergroup Bigfoot, including Grammy-winning banjo player John Herrmann. Their set was full of foot-stompin’ music and quirky tales, including one song that reputedly made a man stick his hand down his pants and wag his finger out of his fly during a funeral. From there, solo guitarist and singer Ari Eisinger lent the air a darker, smokier tinge with blues classics from the 1920s and ’30s. Dressed in business casual, his cropped white hair balding on top, Eisinger would’ve looked more at home at a corporate conference than a folk festival. But his guitar chops and folksy banter proved he more than deserved his spot on stage. Near the end of his set, he even took a crowd request for a song by blues legend Big Bill Broonzy. 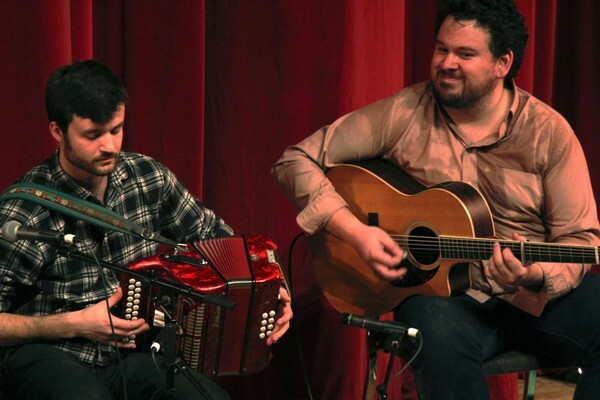 After Eisinger, New York–based traditional Irish band The Yanks proved that folk music isn’t just for those who can remember the 1960s. The four young musicians, mainly wearing flannels, looked like they just stumbled out of an Irish bar in lower Manhattan. The group, consisting of fiddler Dylan Foley, accordionist Dan Gurney, flautist Isaac Alderson, and guitarist Sean Ernest, funded its newest album through Kickstarter (slated to come out this spring or summer), and whipped up one mean set of stomping, yelling, pint-chugging–worthy tunes. During their last song The Yanks had the crowd breaking out into whoops, whistles, and grunts. Sheryl Cormier & Family and Bobby Hicks finished up the evening with two excellent sets. Cormier, with her husband Russell on vocals, son Russell Jr. on drums, and various other relatives on guitar and bass, proved that Cormier & Family is not just a fun band name, and that it is possible to play a soulful, bluesy solo on a bright red accordion with a lobster painted on the front. Hicks and co. then slowed things down a bit, with tight harmonies and a gently bouncing swing. The group all wore suits, and Hicks himself donned a cowboy hat for the occasion. Their low, rumbly yet soothing North Carolina accents provided a serene ending to an evening of intense musical energy and emotion. The festival also included workshops, jam sessions, and a small market in Ida Noyes Hall on Saturday and Sunday where musicians gave free advice on technical aspects of their craft as well as told stories and chatted with fans. Irish guitarist Dennis Cahill exuded wisdom and expertise in the Ida Noyes library on Sunday, including the “first commandment of Irish guitar: Thou shalt not break the phrase.” After talking specifics for a while, he jammed with some fiddlers who were in the room. Loosening up a bit, he mentioned, “This isn’t about safety nets. It’s about having a bit of fun.” The rest of the Fest agreed. 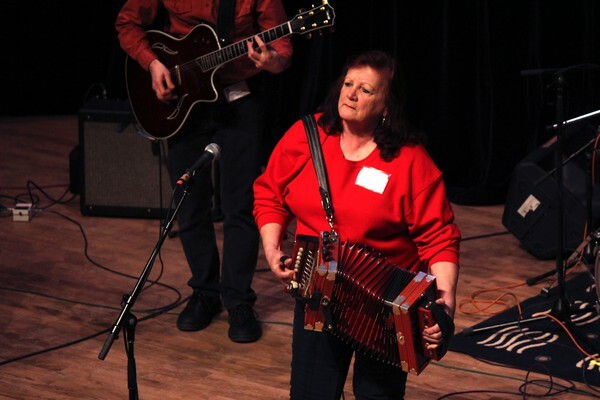 Sheryl Cormier and her Cajun band, including her husband on washboard and her grandson on drums, play on the Mandel Hall stage Friday night. 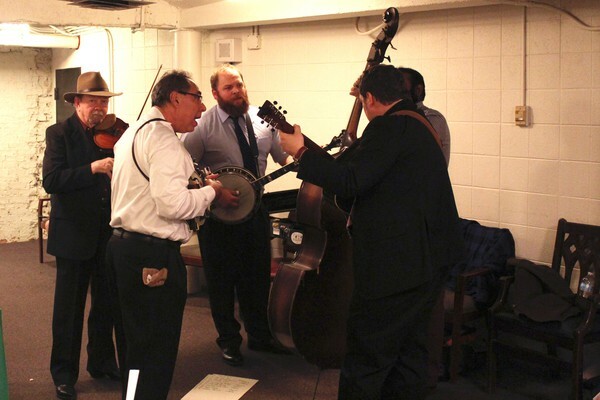 Bobby Hicks and his band practice their bluegrass set in the Mandel Hall Green Room. Dan Gurney (left) and Sean Earnest (right) perform with their Irish band, The Yanks, on Saturday night. Members of Bigfoot (Rhys Jones on fiddle, Meredith McIntosh on bass, Susie Goehring on guitar) at a workshop in Ida Noyes about playing backup rhythm for old-time music. 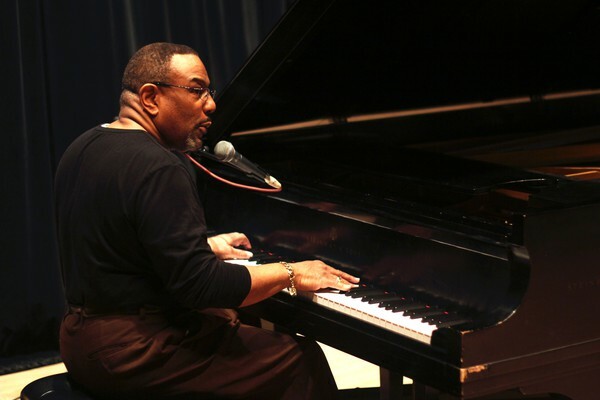 Chicago gospel singer Calvin Bridges practices piano and singing at his sound check before the Sunday night show. Steve Moore begins playing bagpipes to open one of the Folk Fest concert sets. 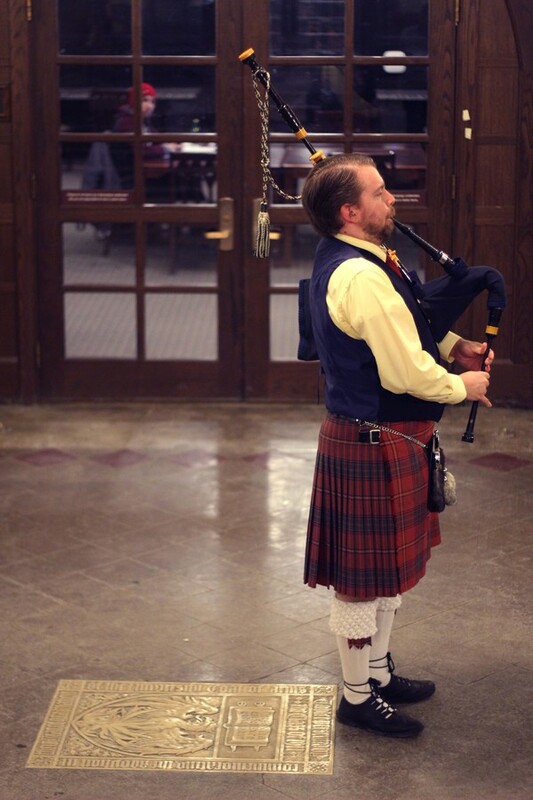 Though this is Steve's first year playing the pipes for the Festival, the tradition of a bagpiper starting each show goes back to the very first Festival in 1961. Old time band Bigfoot plays the last set at Sunday's show. 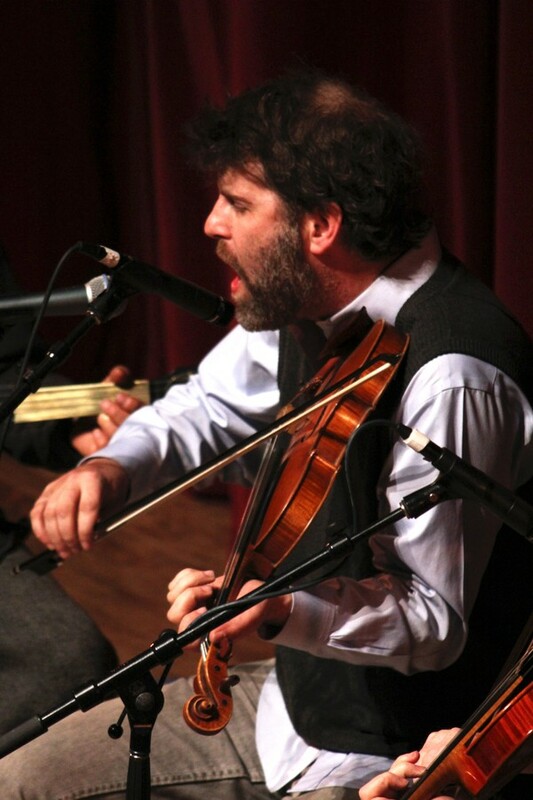 Fiddler Rhys Jones plays with the old time band Bigfoot at Sunday night's show.